The holidays are just around the corner, and it’s a good idea to get started if you’re planning to have a handmade holiday this season. I’m not a big believer in “stuff,” but I do love showing my friends and family that I love them by whipping up handmade creations during this time of year. As I was researching and compiling a list of simple handmade gifts, I realized that most of my list had one thing in common: Mason jars! Whether you’re making food mixes, beauty products, or cute home accessories, you can use your stash of Mason jars to create handmade gifts that everyone on your list will love! Layer your dry ingredients in a quart-sized Mason jar, and tie directions to the jar that list the wet ingredients and cooking directions. Easy peasy! Need a recipe to get you going? This vegan chocolate chip cookie jar mix is a sure crowd-pleaser. In a large pot over medium heat cook the onions for about 5 minutes in the olive oil, and then add the garlic. Cook for a total of about 10 minutes, or until the onions are soft and turn translucent. Add the water and soup mix to the pot and bring to a simmer. Turn down low, and cook until the lentils and rice are cooked and very soft (about 45 minutes). Add the coconut milk, and bring back to a simmer, adding salt to taste, and serve. Enjoy! Do you have a bounty of late fall fruit in the fridge or freezer? Get canning, and you’ve got instant gifts that the foodies on your list will love. Just make sure you’re using solid canning recipes! 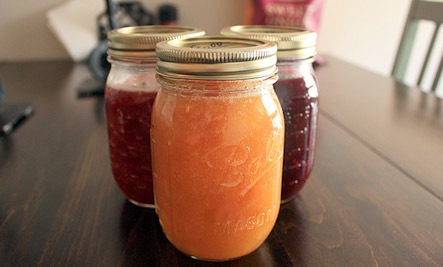 I’m a big fan of Food in Jars for good, seasonal canning recipes. Is proper canning is a bit overwhelming for you? Don’t fret! Try making delicious, simple freezer jams or a tasty chutney instead! Another cozy treat for the holidays is hot cocoa mix. You can make this rich cocoa recipe vegan by substituting more semi-sweet chocolate (Whole Foods makes a vegan semi-sweet chocolate chip). On the instructions, you can tell your giftees to simmer the ingredients in dairy milk, or to make a vegan version, they can use almond or coconut milk instead. Decadent! 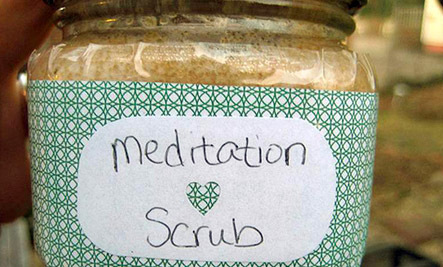 Treat the folks on your list to a decadent sugar or salt scrub! In half-pint Mason jars, combine 2 parts sugar or salt with one part olive oil, then add a custom scent with your favorite essential oils. For the ladies, you can go with flower scents like lavender or rose. The fellas on your list will probably prefer woodsier scents, like sandalwood or rosemary. Have fun with it! Mix up essential oils and experiment! A terrarium is a great way to bring a little bit of greenery to anyone’s home in the winter. Just layer a large mason jar with rocks, a bit of dirt, and a layer of moss, then decorate with woodsy little accessories. CRAFT has a great tutorial on making a Mason jar terrarium. Armed with a jar of etching cream, you can customize pint sized Mason jars into sweet little votive holders. Just make stencils out of contact paper, apply the cream, and rinse to decorate the jar. Then, fill it about 1/3 of the way with lentils, rice, or other dried beans and add a tea light on top. Do you guys have any handmade gifts in the works? I’d love to hear what you’re making in the comments! 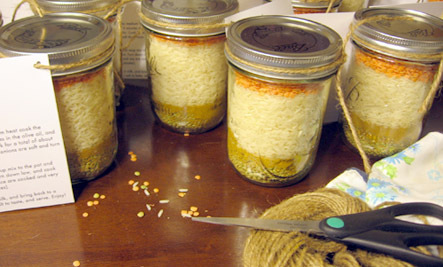 It's better to gift your own recipes in the case of dry ingredient jars. At the very least, test-cook a batch of the suggested recipe to make sure it's worth the gifting, and the trouble your recipients will go to when (if) they make it. Also, if your "wet" ingredient list includes something unusual in the slightest, you will win more fans to your gift if you are thoughtful enough to include that can of coconut milk or chiles in adobo sauce (or whatever) in your gift presentation. Be aware that some of these gifts constitute nothing but food waste, since they will never be used by the unadventurous or the person you're hoping to "tempt" into the kitchen. Some will let your jar sit in their cupboards for a few years. Others will clonk it straight into the bin. Know your recipient. TY. And there must be many more... they are so versatile. Hope it gets many people thinking and being creative. Good ideas don't forget to attach the intruction's to it! I would double check it! Nothing like have a recipe and gift messed up! Don't you just love homemade gifts? Would you like one of my kids? Was a hell of a job getting him into a mason jar! Wonderful suggestions Becky. Thank you for posting a most useful article. Wonderful, thoughtful, inexpensive gifts. That's the way to do it, not bankrupt yourself with consumerism pressure.